Hi friend! I hope you’ve been having a wonderful week! Spring has hit Saskatoon in full force and I’m sitting here typing this post at one of the picnic tables by the river in a tank top and bare feet. BARE FEET! Yes. It’s that time of year again and I couldn’t be more thrilled. Taking time to enjoy the sunshine and the feeling of the grass and dirt and mud between your toes is just as much a part of a healthy lifestyle as green juices and meditation. I might argue even argue that walking through the grass in your bare feet, focusing on the warmth of the sun on your skin and the breeze through your hair is a powerful form of meditation that grounds you in the present moment. Sidebar: I just finished reading a pseudo-spiritual book all about awakening consciousness and your life’s purpose so I’m feeling a little philosophical today. Being grounded in the present moment is so important for your health and wellness because if you’re really truly present, then you’re not dwelling on the past or focusing on the future, which means stress and anxiety are non-existent in these moments of presence. Since you know what a buzz kill stress is on your body, anything that you can do to help mitigate, manage, or minimize your stress is going to be a boon to your health goals. When you’re stressed out your body is constantly in sympathetic or fight-or-flight mode, which means your blood pressure rises, your body begin producing stress hormones such as adrenalin, noradrenalin, and cortisol. And while these hormones have a time and place in the cycles of your life, they are not meant to be activated for any extended period of time because as a rule they turn off many of your long-term survival functions such as digestion and fertility, in favour of in-the-moment survival functions. If you’re constantly ruminating on what if situations or thinking about past interactions or worrying about work, money, relationships, etc. you never really give your body the chance to switch from sympathetic to parasympathetic (rest and digest) mode. To illustrate why it’s so important to spend time resting and digesting, let’s take a look at what happens when you’re in parasympathetic mode. Your digestion hums along at an optimal rate meaning you’re properly breaking down, absorbing, and assimilating the nutrients you need to build healthy cells and tissues. Your heart beat pumps at a slow and steady rhythm, taking stress off your heart muscle. Your blood pressure remains at a healthy level. Your body is relaxed and you’re able to use all those sweet nutrients you just absorbed to repair or regenerate your cells so that you don’t age prematurely. This also means your hair and nails and other “non-essential” body parts are nourished and strong. When you focus on the actual sensations of your body and how she is interacting with the world around you, you’re better able to immerse yourself in the present moment and ease your body into that delicious rest and digest mode required for health and happiness. There are many other ways you can ground yourself in the here and now, but literally grounding down into the earth and feeling your connection with the planet is one of my favourites. And since springtime is upon us I’m writing a prescription for some sweet bathing in Mother Nature. You can easily do this while you’re outside exercising by bringing your awareness out of your brain and the constant flow of thoughts circulating and into your body. Listen to your breath as you’re running. Or feel the different textures of the earth as you’re out walking. Just focus on being, rather than doing. And on feeling rather than observing/categorizing. It might be hard at first, but the more you practice, the easier it will become to slip into the now and reap all the benefits to be found therein. Well that’s my philosophical, pseudo-scientifical rambling for today friend. The gist of it is to get outside, get out of your head, and start enjoying where you are right now. Not where you were or where you’re going. You might be surprised to see how that ends up changing the way you see the world. If you’re looking for more ways to become present and heal your body, make sure you download my FREE Stop Self-Sabotage Workbook by clicking here. It’s packed with information and tips to help you achieve all your health goals. Hello everybody! Thanks for stopping by. 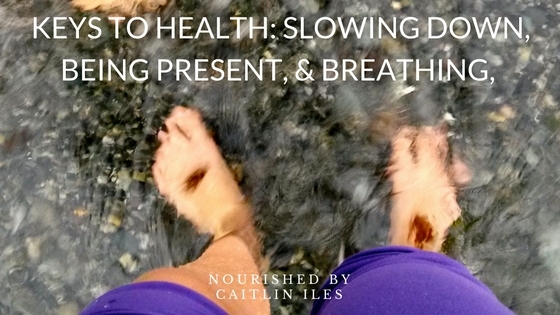 Caitlin Iles is a Holistic & Culinary Nutritionist and Yoga teacher who focuses on healing the body through gentleness, self-compassion, the latest nutrition research, and time-tested, evolution-based dietary concepts. Her mission is to help her clients change their relationships with food, so they can create their healthiest bodies and their most fulfilling lives. Creating space for healing at wellness retreats, cooking classes, and live talks is her passion. She has written for publications such as Mind Body Green, Herb Affair, The Hearty Soul, and ALOHA Way Magazine. Check out my Most Popular Posts! ALL CONTENT © 2012-2017 CAITLIN ILES UNLESS OTHERWISE STATED. Join the Supportive & Inspiring Nourished Community & Get a FREE 7-Day Healthy Detox Meal Plan!